The story of a walk from the Irish Sea to the North Sea. Suggests detours and alternate routes -- around the boggy bits, along Romanroads, and into favorite pubs. 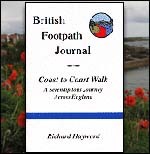 More of a journal than a detailed footpath guide. "A walking trip is a life in miniature!...HEre is one such lifetime, intensely lived. "BF848403, 108 pp. "My first day on the Coast to Coast Walk left me just two miles along the way, with all my worldly possessions festooned wetly about my room, while I sat starkers on the bed reading the very fine hand written print about tomorrow's route... Already I was beginning to harbor suspicions about this Wainwright fellow.". KISDON HILL..... The return journey, Keld to Muker, across the back side of Kisdon Hill is a pure delight, yet relatively unknown. Most walkers choose the front side of Kisdon Hill, which joins the Pennine Way along the escarpment. There are good views of Swaledale, but what guidebooks do not mention is that the path is rough and rocky. Thus you spend more time watching where to place your feet than admiring the view. The back side of Kisdon Hill is, by contrast, a wide grassy path -- along an old "drover's road" for a mile or more, with excellent views to the west and back at the high moors leading to Nine Standards Rigg. (Imagine, I came across that only yesterday!) Then Muker suddenly appears, with Swaledale itself curving away to the east. Coast to Coast Walk, by A. Wainwright: Classic guide by the inimitable Wainwright. His wry humor and careful route descriptions are valuable companions along the way.